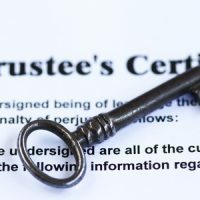 What are Trustee Sales Loans? These loans finance a trustee who is taking over or buying a foreclosed property. The lender takes over the property from a defaulter to recoup the outstanding balance. The takeover occurs after 60 days of defaulting on the loan. Thus, like in any auction, the house goes to the highest bidder. The conditions of the mortgage contract were not met, leading to foreclosure. When the borrower defaults on the payments they receive a “notice of default”. If they fail to pay their dues, the bank sends a final letter giving the owner 21 days to vacate the property or pay up. Failing to pay up, the bank or lender auctions the property and the trustee takes possession of it. Take stock of the above possibilities to avoid any liabilities, and always ensure that the property you bought as a trustee is vacant when taking possession. Loan approval is important before buying foreclosed properties. The issue is that you cannot see the inside of these properties or inspect them. The risk is that if you borrow under a wrong assumption, then you may end up with higher liens, jeopardizing your investment. Thus, try to get a pre-approval for the foreclosed property ensuring correct assessment before you apply. Get cash or a cashier’s check for the property as the trustee sets the price and lowest bid. This price includes the balance credit and lawyers’ fees. The trustee takes a check or cash deposit before the bidding begins to make sure you are in for the deal. The building inspector may ask for an “as is” examination of the property after the sale. The other issue to address will be the liens and structural issues. You may even have to evict the previous owners and meet renovation costs. Last but not least, do your homework about the property, the area, and the market conditions before you bid. – Depends on the type of financing you can benefit from. Some choices you have include Fix and Flip, CRE, CMBS, Hard or Private money, etc. Fix and Flip have a period of 12 months with a rate of interest 7 – 12% with no pre-payment penalties. The CRE loans have a 5 – 20 years term at the rate of 7%, amortized over 30 years. CMBS terms for 5 – 10 years with an amortization period of 25-30 year. The rate of interest with Life companies is 3.6 – 6% with the smallest lending of 5 million and 20 years amortization With soft money, the rate may go up to 6.5 – 18% and Hard Money 10-21%. Hard money loans term for 1 – 5 year at a rate of interest 10 – 15% depending upon the perceived risk. The points may range from 2-4% of the amount lent, the After-Repair Value (ARV) and LTV ratio.